Bladder stones in dogs come in three main types: calcium oxalate, calcium phosphate, and struvite. Calcium phosphate is the least common of the three and is seen predominately in Dalmatians. Calcium oxalate and struvite are the two most common kinds of stones, so these are the two covered in this article. Calcium oxalate stones are very common in Miniature Schnauzers, Yorkies, and Lhasa Apsos. 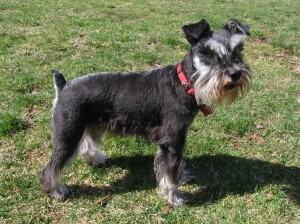 We see a lot of male Miniature Schnauzers with these stones. In these dogs, the main reason for stone formation is that calcium is not processed properly in the kidneys, resulting in stone formation in the bladder. Struvite stones are more common in Cocker Spaniels, Bichons, and Poodles. They can be caused by chronic, undetected infections or a problem with absorption of minerals and proteins. Bladder stones can develop at any age, but are more common in middle years, 4 to 7 years of age. Symptoms include frequent urination, asking to go out more often and accidents in the house. Male dogs can also become unable to urinate due to blockage from a stone, and this is a very serious problem. Some dogs can be asymptomatic for a long time. The bladder wall can thicken to cope with the bladder stones. Most dogs will eventually experience one of the symptoms mentioned or seem to suddenly have pain with urination, and blood may be seen in its urine. At this point, a urine sample is needed to figure out if this is a urine infection, a bladder stone, or something else altogether, like diabetes (common in Miniature Schnauzers). This may be challenging—little dogs that are low to the ground and do not like us chasing them around trying to get a sample. If the owner can catch a sample at home in a clean dish, it is best to bring it in immediately. If you cannot bring it in, you can put it in the refrigerator for about 4 hours, but let us know if you do. If the owner cannot catch a urine sample, it is best not to let the dog urinate for about 4 hours prior to it visiting for us to get a sample. The dog will need to be examined to put all the clues together to figure out what is really wrong. X-ray pictures are needed to confirm bladder stones. On a radiograph, the bladder stones look like little white rocks and usually stand out, whether large or small. Treatment can be a special prescription diet in combination with antibiotics, or the dog may need surgery to remove the stones. After the stones are removed, they are sent to a diagnostic lab to determine what kind stone they are. The dog can then be put on an appropriate diet to prevent a reoccurrence.